What is the best way to safely introduce (or reintroduce) a cat into the household? 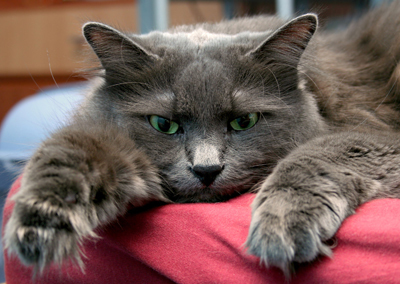 In order to ensure that there are no injuries and that all introductions are positive, a desensitization and counterconditioning program is the best way to ease or re-introduce a cat into a household (See our handouts on behavior modification; 'Behavior Modification - Implementing Desensitization and Counterconditioning', 'Aggression in Cats – Territorial and Fear Aggression To Other Household Cats'). "This arrangement provides a separate territory within the home for each cat... "
Begin by confining the "new" cat to a separate room or portion of the home with its own litter box, food, bedding, perching area, play toys and water. Allow the existing cat to continue to have access to the rest of the home. This arrangement provides a separate territory within the home for each cat, and allows both cats an opportunity to adapt to the smell and sounds of each other, without the possibility of direct contact or physical confrontation. If the new cat is housed in a screened-in porch or a room with a glass door, it may also be possible to allow the cats to see each other through a safe partition. Be certain to provide sufficient play, social interactions and even a little reward training with each of the cats. If you are planning to use a crate or a harness and leash for exposure exercises, be certain to spend some time training the cats to accept the harness and to get accustomed to their crates. A FeliwayTM diffuser or FeliwayTM spray on the cat's bedding or in its crate may help each cat to adapt and settle more quickly. Offer small meal portions (rather than free choice feeding) and treats on opposite sides of the common doorway to increase the proximity of the cats. Remember that, by separating the cats, you are not only providing an opportunity for them to adapt to the presence of the other cat, but also to prevent threats, fearful displays and attacks which would only add to the fear and anxiety. When the cats show no fear, anxiety, or threat toward each other behind closed doors, it may be useful to switch positions, with the other cat confined while the new cat is allowed household access. The next step is to progress to controlled exposure exercises. Training should occur when the cats can be occupied in a highly "rewarding" activity such as feeding, play, or treats. Provided both cats are far enough apart to minimize the possibility of aggression, and the reward is sufficiently appealing, the cats will focus on the rewards rather than each other. In addition, if the rewards are saved exclusively for these introduction times, the cats will quickly learn to expect "good things to happen" in the presence of each other (counter-conditioning). In addition to ensuring that the cats are at a safe enough distance to minimize fear, both cats (or at least the one that is likely to be the aggressor) can be confined to an open wire mesh cage or a body harness and leash. This will ensure that the cats can neither escape nor injure each other, and provides a practical means for controlling the distance between the cats for desensitization and counterconditioning. If the cats have been in cages during the first training session, they can be placed in each other's cages at the next session (so that each cat is exposed to the other cat's odor). By using cage confinement of one or both cats, or a leash and harness on one or both cats, the cats can be brought progressively closer at each subsequent feeding session, as long as there has been no fear or anxiety and both remain interested in the food. Over time, the cats are fed closer together until a point where the cats can eat or take treats in each other's presence. Another way to integrate cats is with play therapy. Some cats are more interested in play, toys or catnip than they are in food. One of the best toys is a wand or fishing rod handle with a stimulating play toy such as a catnip mouse or feathers on the end for chasing and pouncing. Begin by having both cats play at a distance from each other. Or, keep one cat in a crate with food while the other is out with play therapy. Over time, put the toys between the cats and let them play with the toys together. "Odor may help cats learn about each other and enhance harmony..."
Since odor may help cats learn about each other and enhance harmony, rubbing each cat with a towel and then bringing the towel to the other cat may help them get used to the smell of each other. Counterconditioning with favored food rewards when presenting the towel or rubbing the cat with the towel may also help facilitate the introduction. Be sure to wipe the towel gently over the areas where scent glands are most prominent (i.e. the face, back and tail) first on resident cat, then using the same towel rub the new cat and leave that towel there. Repeat the process in reverse, rubbing the towel on the new cat and then on the resident cat and leave the towel with the resident cat. What if neither cat seems to get comfortable with the other cat? Introductions must proceed slowly. The cats need to be far enough apart that they are relaxed and will take food or a treat while in the presence of the other cat. If the cats will not eat then they are too anxious and probably too close together, and the introductions are not accomplishing the goal of learning to associate the other cat with pleasant things. If the cats will not eat in each other's presence, try moving the dishes further apart. 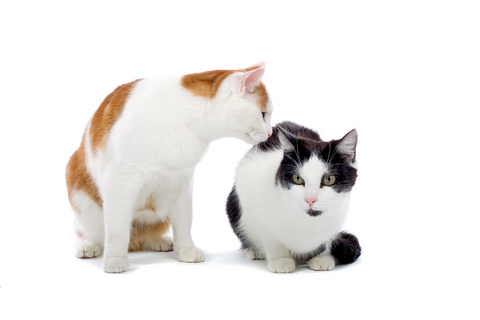 If one or both of the cats still will not eat, separate the cats, do not give any food, and repeat introductions with food in a couple of hours. If the cats eat at that time, repeat using the same distance at the next feeding. If things go well, you can move the dishes a little closer together at the next session. If introductions where the cats can see one another are not successful, you will have to start with a much milder level of the stimulus. You might begin by keeping the cats in their own rooms and feeding on opposite sides of the door. A glass or screen door would allow you to add the stimulus of sight while you feed the cats on opposite sides of the door. While they are usually aware of the other cat, the fear or anxiety might be diminished and the cat will eat. If you don't have a glass or screen door on the room, the next step would be to prop the door open a few inches so that the cats can see each other while they eat. This is a slow process; you cannot rush things. Allowing either cat to interact in an aggressive manner sets the program back. The cats must remain separated except during times such as feeding when the cats are distracted, occupied, and engaged in an enjoyable act. In other words, good things are associated with the presence of the other cat. If the cats are doing well, you might want to increase their time together. However, if there are specific times, specific resources or specific areas of the home where threats or aggression are likely to recur, long term or permanent separation at all times except for supervised social play, feeding and training might be necessary. Although preventing recurrence is the goal, there may be occasions where aggression begins to recur. At the earliest signs of fear or anxiety, it would be preferable to distract the cats with a "come" command (if the command has been reward trained), or by pulling on the leash and harness, if one has been left attached. In this way the aggressor is inhibited and the fearful cat (which might be stimulating further chase and attack by the aggressor) may begin to feel more confident when the owner is around to supervise and inhibit the aggressor. Counter-condition and reward the fearful cat for not running away. Reward and countercondition the aggressor cat if it comes to you, settles down and leaves the other cat alone. With enough different litter boxes, climbing areas and places to hide, it should be possible for many cats to adapt and remain together (or perhaps be separated while the owners cannot supervise). Another option is to install an electronic cat door through which one cat can escape to its own room. These cat doors will only open for the cat wearing the activation collar. "Despite slow and careful progression, some cats may continue to display aggression..."
Despite slow and careful progression, some cats may continue to display aggression, and it may be necessary to accept that they may never be compatible housemates. Although cats do live in social groups, they also have the opportunity to leave them if they do not feel welcome. The social groups we create in the home do not provide that opportunity. The only way to avoid territorial competition in these cats may be to find a new home for one of the cats, or to provide separate living quarters for each cat within the home. If the cats get along at certain times of the day, they can then be allowed limited exposure and interaction at these times. A leash and harness, or perhaps an air horn or water rifle, could be used to safely separate the cats should any aggressive displays emerge. If the problem is too severe, it may be helpful to medicate one or both cats. The option of drug therapy should be discussed with your veterinarian.